Have you noticed that there are no third party balance boards for the Wii? It's honestly kind of weird in an industry that's filled with accessories. You can't even pick up a board separately from it's pack in game, Wii Fit. 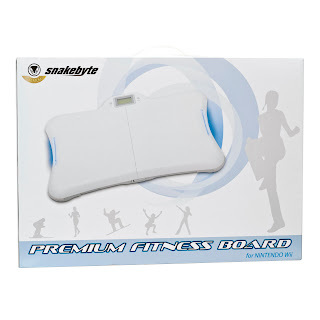 Well, peripheral maker snakebyte has noticed and just might have something you may be interested in- It's a stand alone balance board... weight for it... that doubles as an electronic scale! The built in LCD screen that sits at the top of the unit shows connectivity to the Wii when it's being used for games and shows your weight when it's disconnected and used as a regular scale. Pretty cool. The wireless scale/balance board supports up to 390lbs and is available in white or black. You can order one right now at www.snakebyte-usa.com for $69.99, which ain't bad at all. Bonus: it's made of anti-fungal plastic. You don't want fungus on your controllers kids. Trust me.